To see the wonderful progress made by SharonB on her hussif and by others on their respective projects visit Pintangle. I know it is not related to embroidery, but I have joined a thrice weekly exercise session with my neighbour. This is also progressively working out the unused stiff muscles. Two edges were completed on Randje per week challenge. these edges were started in March, they are being completed now. The 18th edge has some back stitches. I think the sleeves are complete on this cream tunic with ethnic embroidery. 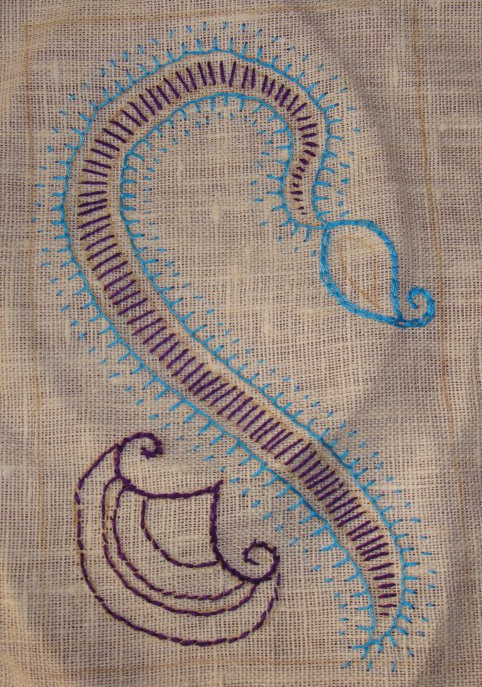 This is a small border design which started with buttonhole stitch variation in antique violet cotton skein. Stem stitches in green cotton skein on these hearts. The working of this stitch is on Pintangle. This is also a simple stitch with lots of possibilities. In this piece I did not do much of experiments. 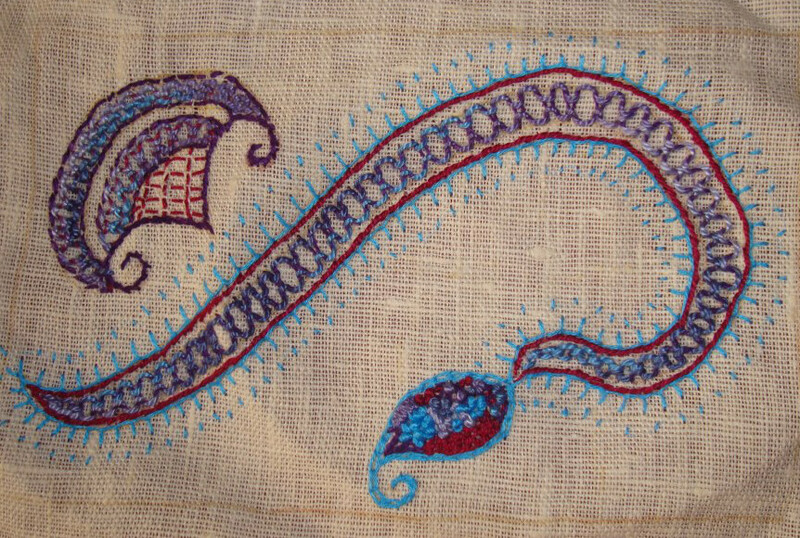 An element of a traditional Indian design was chosen to work this stitch. An outline with whipped and laced buttonhole stitch was also tried on this piece. 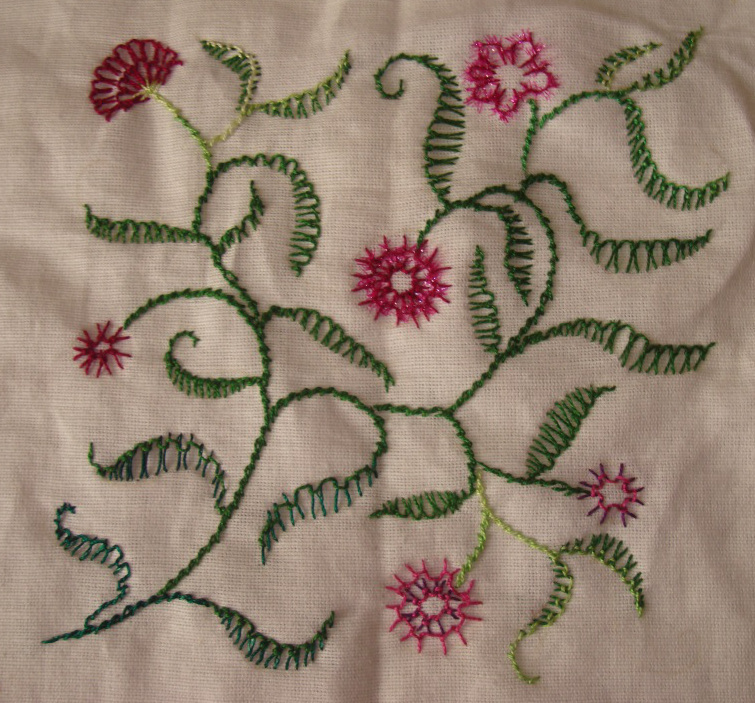 It was started with buttonhole and straight stitches. Straight lines were stitched to work the double lock stitch. The side motif with two versions of double lock stitch worked in variegated perle cotton # 5. 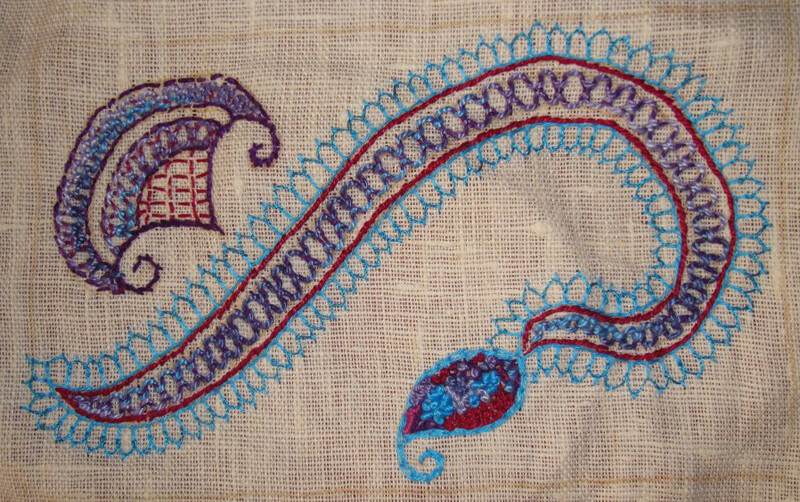 Double lock stitch and some textured stitches inside the paisley. Trials of alternating whipping and lacing. The first one on the left was chosen to work this piece. This pattern was not ideal to work variations of double lock stitch. 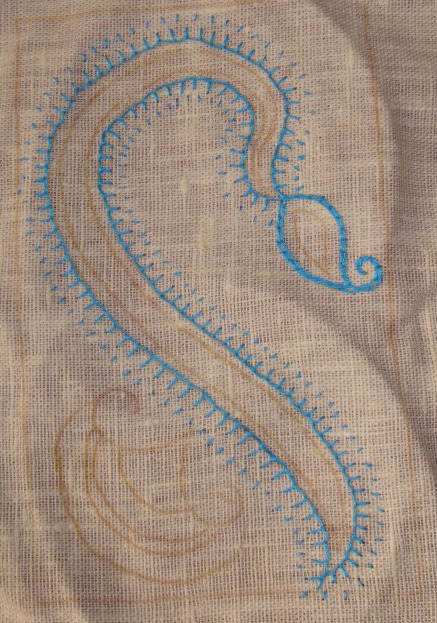 But working on this, helped in experimenting a new way to work this buttonhole stitch outline. The lock stitch was instrumental in bringing out this idea, I suppose. 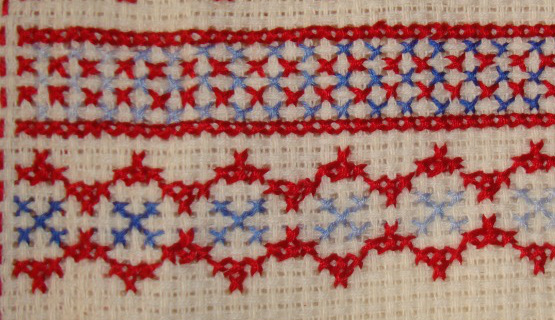 This week’s stitch was worked in two colours. I am maintaining this red and blue colour scheme. The graph for these edges are here. I am a day late in posting the work in progress. To see others progress visit Pintangle. I joined studio journal group on flickr. The hussif was not taken out this week at all. Most of this week was spent on working the lock stitch sample for TAST. 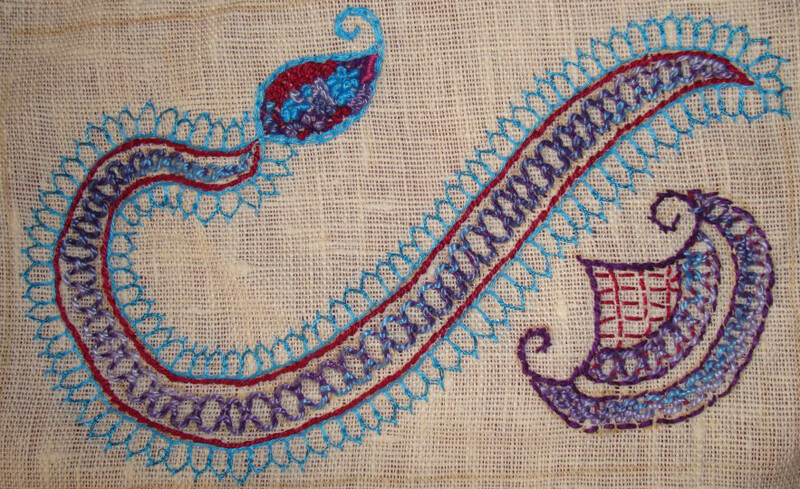 Indian ethnic embroidery design was drawn on a cream fabric for tunic, the size is fairly big with six colours and mirrors. The work on this piece could take a while. I am also pondering over some more ideas for other tunics with the help of the journal. The 15th and 16th edges were completed on RPW challenge. The method of working this stitch is on SharonB ‘s Pintangle. It looked pretty easy, when looking at the samples. 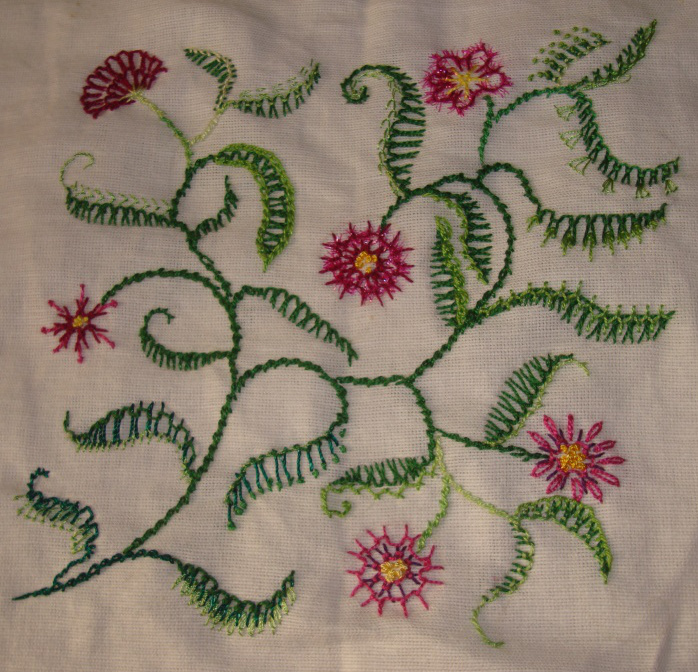 So I decided to work this stitch on leaves and flowers. 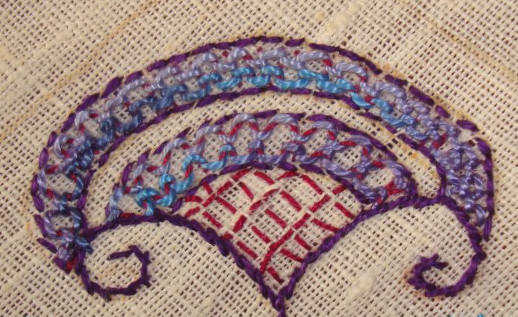 Rope stitch was used for the stem. The other stitches- chain stitch, running stitch, arrow head stitches. 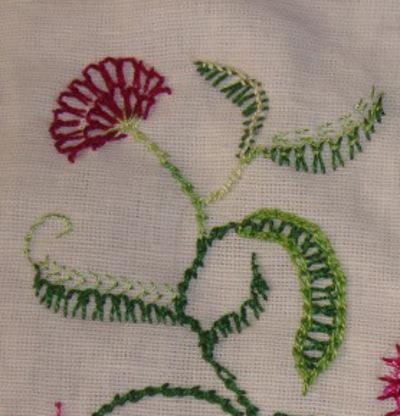 Two flowers also got detached chain and pistil stitches worked around them. Perle cotton# 8 was used with some fine silk thread. I controlled the urge to work this stitch as a band sampler and worked this piece. I need to practice this stitch more to gain more control. The graph pattern for these edges are on this blog. This week there were not much of working back and forth, cutting and rejoin , easy edges. 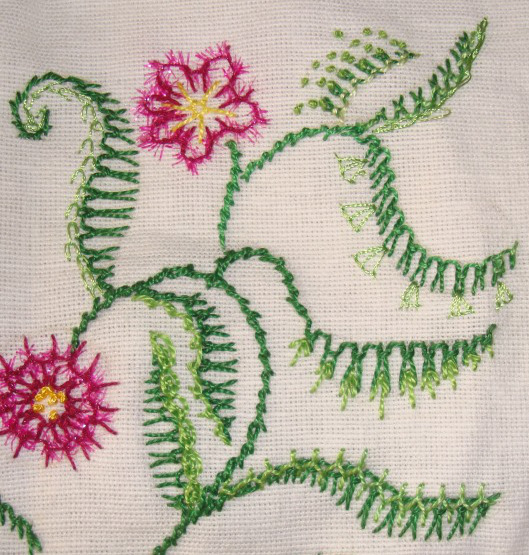 Started this week’s lock stitch on TAST challenge on a floral pattern. To understand how the posting this work in progress is helpful, visit Pintangle. I completed last week’s TAST stitch. The hussif was taken out and kept back, when a mistake was found on the black work filling. It’ll be hard enough to pull out the waste canvas, so the option to rectify the mistake is out, just have to think of something to work over the flaw. The black yoke was completed with phukari embroidery. The earlier worked edges were completed on Randje per week challenge. 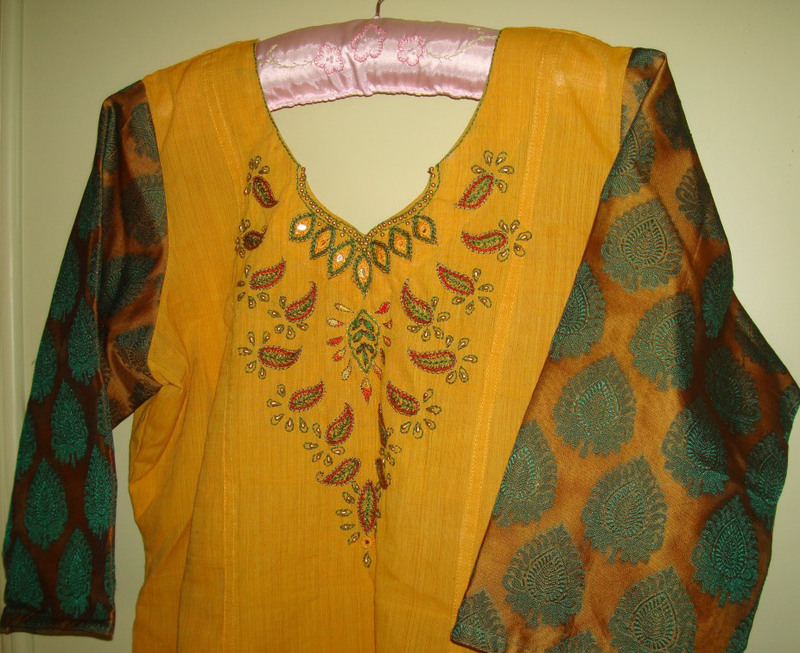 The yellow tunic with chanderi silk cotton sleeves in its full glory. 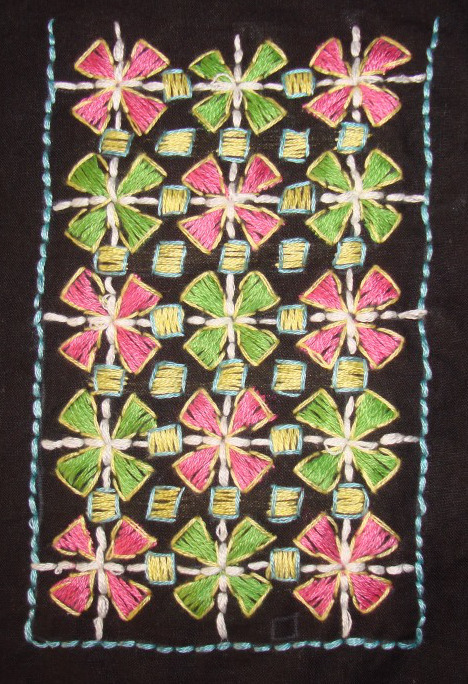 Gujarati ethnic embroidery was drawn for a cream tunic with multi coloured striped salwar fabric. The tailor has to mark the place for front and sleeves. The routine of working on the journal was maintained this week.